Please join us for the next Open House Art Gallery on Saturday, March 26, 2011, starting at 6 pm. Bunnies versus Piggybank. 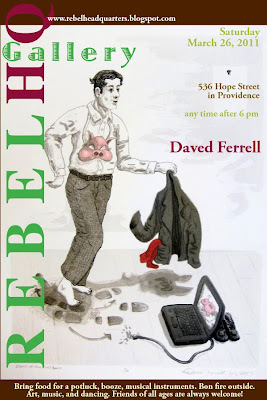 Intense, warm, full of questions narration of a wonderfully complex printmaker artist Daved Ferrell. Celebrate Life. Celebrate Art. Feed the Soul. This entry was posted in Uncategorized on March 3, 2011 by dorota. I’m proud to say that I was there last night! Great crowd, great fire, great pie.